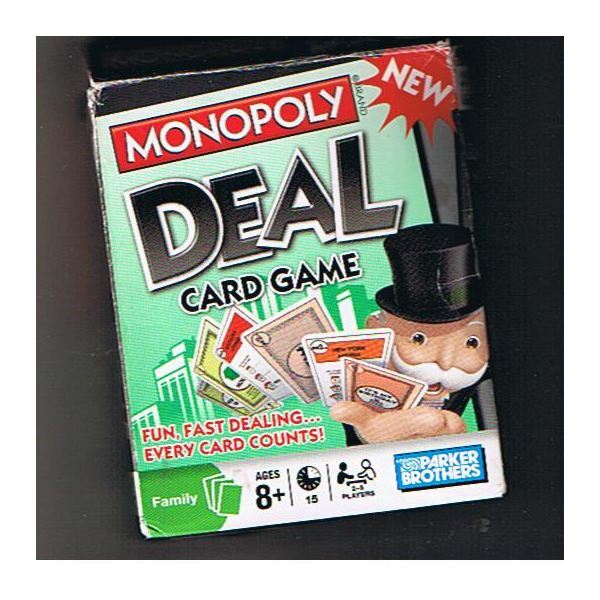 The rules for Monopoly Deal: Card Game are simple enough to learn in just a few minutes. The game is for two to five players with a single deck of cards but can support six or more players by combining two decks together. 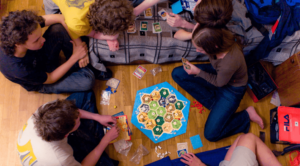 Players race against each other collecting color groups. The first person to collect three complete color groups wins the game. It sounds easy, but assets are liquid in Monopoly Deal. Players can steal properties from one another, and even snag entire color groups by using the "Deal Breaker" card. Begin the round by shuffling the deck of cards and dealing five cards to each player. Place the remaining cards in the center of the table to create the "Draw Pile." Leave room beside it for the "Discard Pile." Decide who goes first, with play continuing clockwise. On your turn, draw two cards from the draw pile. You may then play up to three cards on your turn: you can play money, action cards, or properties in any combination. You can play a maximum of three cards, but you may choose to play one, two, or even zero cards. Cards can only be played from your hand, not the board, and you can never put any cards from the board or discard pile back into your hand. If at the end of your turn you have greater than seven cards in your hand, you must discard to bring your hand size back down to seven. Choose which cards to discard, and place them in the discard pile. Your turn is over, and play continues around the board. 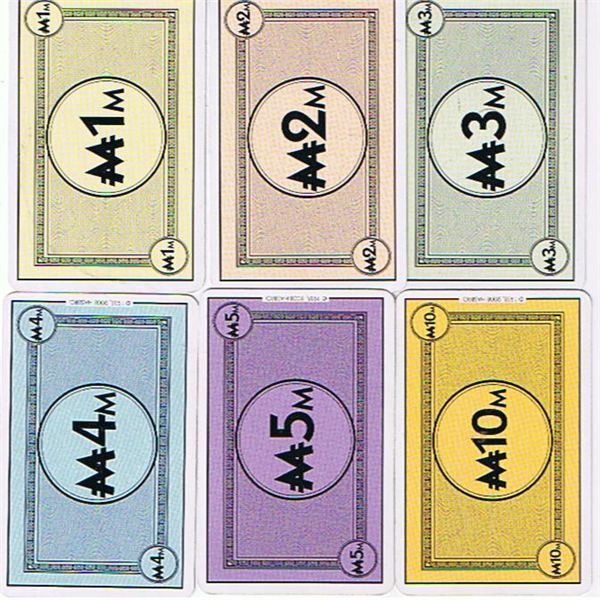 Money: Money, or "M", serves no purpose in Monopoly Deal other than to shield you from your debts. If you don't have sufficient funds on the board to cover any rent or any other in-game obligation, you have to pay with property. 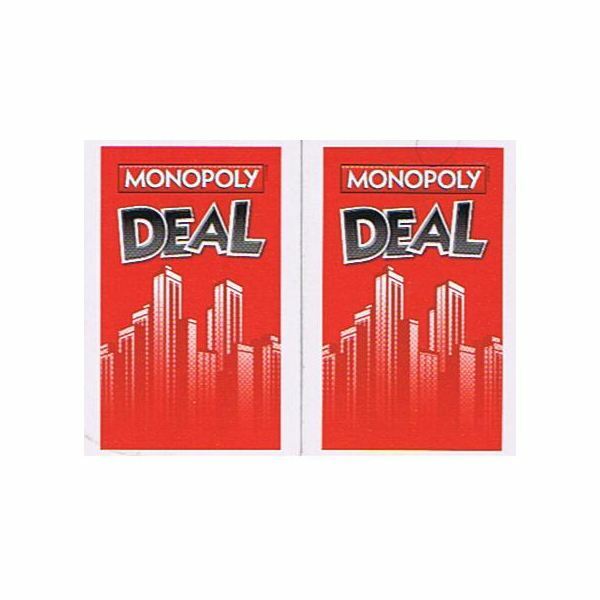 Play your Monopoly Deal money into your play area. One key rule to note, you can't make change in Monopoly Deal. If you owe your opponent 1"M", and you only have a 10 "M" note, you are out the whole ten dollars, or you will have to pay with property. Action Cards: Action cards allow you to create an action within the game. These actions are varied and include charging rent to a specific player, charging rent to all players, draw cards, build houses and hotels, force players to pay debts, and steal properties. There is even a "Just Say No" action card which counters an action that is played against you. Action cards also have a "M" value, and can be played directly to your money pile. If you play them in this manner, they perform no action; they are only money. With the exception of "Just Say No," All action cards must be played on your turn. Property: The rules for Monopoly Deal: Card Game are such that the only way to win is to acquire property. Property can only be played on your turn, and money cannot be used to purchase property. You must instead play properties from your hand or take them from other players using action cards. If you have wild cards or dual-properties, they may be manipulated during your turn to complete or break up sets on your board. They may be manipulated as many times as you want during your turn, but never during an opponents turn. Unlike most action cards, houses and hotels have rules of use that are not listed directly on the card. Remember, this is a Monopoly variant, and the normal build rules apply with only some minor variation: you can't build houses or hotels on Railroads or Utilities; houses and hotels must be built on a complete set; and you may only build one house and one hotel on a color group. Monopoly Deal Card Game Rules Explained: There are some rules issues that aren't explained in the Monopoly Deal directions, but some members of the Board Game Geek forum took the initiative to email Hasbro for clarifications on some Monopoly Deal Rules. Answers from Hasbro are marked as "Official" and answer that have not yet been answered officially are marked as "Unofficial." If you can think of rules questions that aren't listed below, leave a comment stating the question, and I will see if I can find the answer, or I will follow up with Hasbro if they have not already made an official ruling. Double the Rent: Can you play two double the rent cards together? 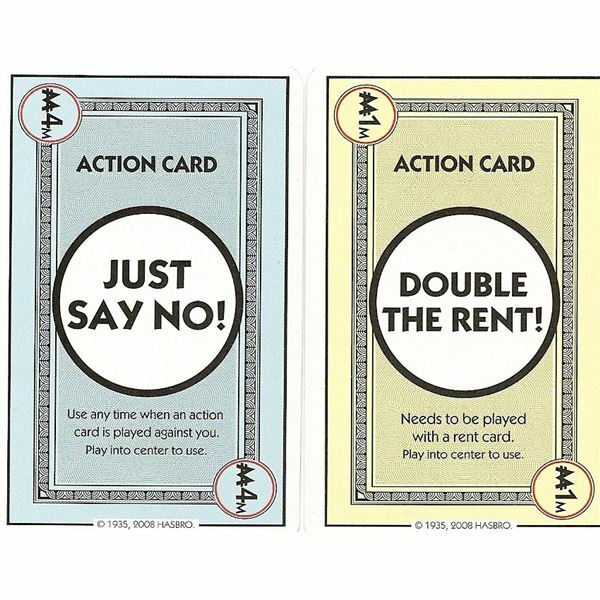 Unofficial Answer: While the Monopoly Deal rules don't specifically address this issue, I think that you can play two "Double the Rent" cards along with a rent card, charging your opponent four times the normal rent and using all of your actions for the turn. Just Say No: Does playing a "Just Say No" card on your turn count as an action? Official Answer: "Just Say No" cards are not counted as action cards and do not count toward the three-play limit per turn. House and Hotel Rent: 1) Do you get to add the value of a house and a hotel onto the rent value? 2) Are Houses and Hotels considered assets? Official Answer 1): You only add the value of the Hotel onto the rent for properties that have a house and a hotel. 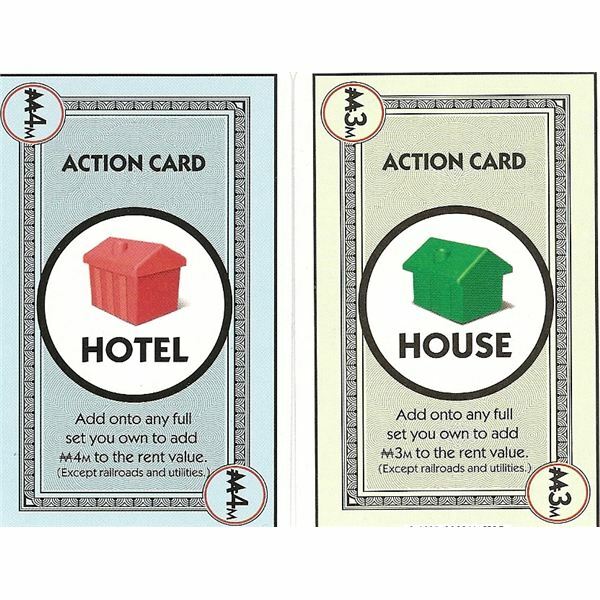 Remember in traditional Monopoly there is a specific rent for houses and one for hotels. Play Monopoly Deal in the same way. Official Answer 2): Houses and hotels, when added onto color groups, as considered assets. You may pay rent with them. If a color group containing improvements is broken up, place the improvements (houses/hotels) into your money pile. They are now money for the remainder of the game and cannot be converted back to improvements. Now that you have the rules figured out, you are ready for some basic Monopoly Deal Strategy. Money First: Money acts as a cushion against property loss in Monopoly deal, so you should build up a sizable bank roll before you start laying out property. A good rule of thumb is to be able to pay for the common, non-rent debt cards–"Debt Collector" and "It's My Birthday." That's a 7M forced debt between those two cards, and it is not uncommon to have one or both played against you in a single turn. Don't Play Sets: Since entire sets can be stolen with a "Deal Breaker" card, it is a good rule of thumb to only put incomplete sets in play. You can keep the cards needed to complete the set in your hand and play them simultaneously when you can get three color groups in one round, winning the game. There are exceptions to this, however. For instance, if you can devastate your opponent by doubling the rent on a completed color group with improvements, resulting in the opponent yielding property to pay his debt, you might want to do it. But as a general rule, stay away from complete sets. Save the "Just Say No" Cards: I know it is annoying to pay a big rent early in the game, but JSN is simply too powerful to waste. Save it stop something that will devastate you, not simply something that is annoying. Try to Win Property: Don't play rent cards or other debt-inducing actions to simply acquire money. You should use your debt-inducing cards when they will result in a gain of property from your opponent. All Monopoly Deal Card Images scanned by Michael Elkins. Monopoly Deal Rules adapted from the official Monopoly Deal: Card Game rules. Windows Phone Monopoly – Easy Achievements for Xbox LIVE! 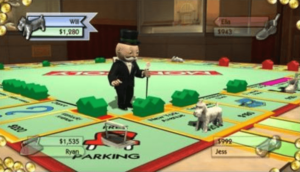 PS3 Monopoly: Does this Monopoly Game Really Stack Up To Playing it on the Board or Not?